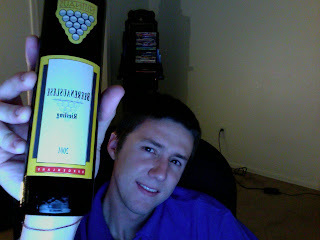 I first tasted this Austrian Beerenauslese at a distributor trade show about three years ago. At the time it was one of the better dessert wines I had tasted from Austria and I was quite impressed with the QPR when comparing it to the sweet wines of Germany and France. I'm not too educated on Austrian wines but what I do know is that this wine is from a place called Gols that is well known for it's sweet wines. The wine has a quite golden and almost orange-like color, which I'm sure is the product of being in the bottle now for eight years. The wine was harvested at 320g of sugar per liter of wine and is 12.5% alcohol by volume. On the nose I get powerful aromas of apricot nectar, orange marmalade, honey, lime peel, and perhaps a hint of pine sap. On the palate this wine continues to show quite distinct flavors of apricot nectar, along with the honey, marmalade, and slight hints of pine that were fore mentioned. The apricot flavors linger onto the finish along with a hint of ginger snap.